While NASA was in the process of landing a car on Mars in the wee hours this morning, the flight director on the Curiosity lander mission instantly became an Internet celebrity. 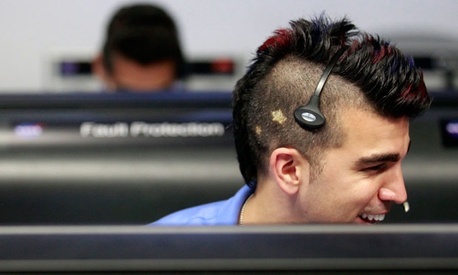 It would be nice to think that was because of the tremendous job Bobak Ferdowsi and the rest of the mission team did pulling off a technological feat that staggers the imagination, but it may have had something to do with the imagination he showed in his choice of haricuts: a mohawk with stars cut out on the side of his head. Of course, by this morning Ferdowsi already had inspired a Tumblr (beware, the URL and some of the content are not entirely safe for work), replete with confessions of love and offers of marriage. And of course, he's got a bunch of new friends on Twitter, where he signed off after Curiosity's touchdown with this: "Internet, you win this round. I'll be back later, but thanks so much. Now going to celebrate with all my friends and team!" Previous Post | Will Curiosity Kill the Cynicism About Government?